There's something to be said for the simplicity of lager. Ales, on the other hand, are not unlike Shakespeare's observation on the practice of deceit—a tangled web. Let's take Brown Ale, or should I say American Brown Ale, Northern English Brown Ale and Southern English Brown Ale. These little ales couldn't be simpler—American Browns are slightly bitter and can be light or very dark brown, while the Southern English varieties are sweet, malty and very dark—but fairly weak. Northern English Browns are amber to reddish brown, and while sweet, they are often quite dry and, typically a bit stronger than their southern brothers—but not as strong as their American cousins. See how simple that was? Two or three flow charts later and viola—the intricacies of Brown Ale! Lager's not like that.  When it comes down to it, you've got two categories, light and dark—compare this to the waterfall of ale categories. Seriously, look at the basic frame work of ales: Pale Ales, Brown Ales, Milds, Scotch Ale, Porter and Stouts, Wheat Beer, Barleywine and Strong Ales, not to mention the Belgians and all their subsets. It's like the cop car pile-up at the end of the Blues Brothers. Now, I'm not talking style here, I'm looking at the broader context, and the simplicity of the lager system is it's brilliance. In fact, lagers are like the arch-nemesis of "style". I figure, 99% of the world thinks there are only two kinds of beer anyhow—light and dark—so, why not go with it. That's exactly what Full Sail Brewing in Hood River Oregon did. You may remember Full Sail as the brewery I insulted back in July—but that's behind us now. This post is here to say what a brilliant idea it was for them to capitalize on the simplicity of lager with their Session line of lager brews. 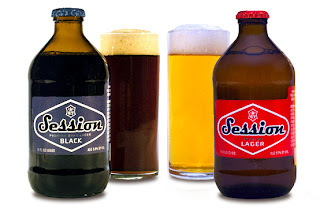 Full Sail has devised two basic beers—Session Lager, which is light and Session Black, which is not. Two simple recipes, and all the lager bases are covered—simple and brilliant. Session Lager has bright, sparkling golden, tone with that classic grainy and grassy lager aroma. It's an easy drinker with an almost cracker-like malt quality. It's crisp with a citric edge, not tart, but sweet, boarding on fruity. It's bitterness is almost non-existent, yet I wouldn't call this one particularly malty. The hop flavor is there, in the subtle grassy way that only can come from Saaz hops. All right, I'm going to go out on a limb here and make my opinion known here—this is the ultimate pizza beer. Really, this is the beer you want to be drinking every time you eat a slice. Whatever the topping—anchovies, pepperoni, black olives, pineapple, or sweet corn and baked beans, for those of you in the UK. Thin-crust New York, deep-dish Chicago or new wave Californian—this is the beer to have when the dude in the trucker hat and the 1984 Honda Civic hatch-back is at the door with your pie. Meanwhile, on the dark side of the moon, Full Sail also offers Session Black—a deep, dark chocolate hued beer with, yet again, that same grainy and grassy aroma—but with a subtle smokiness. Black is more roasty than it's lighter counterpart, with its toasted malt backbone stepping to the forefront. Those dark malts bring chocolate and caramel to the party and it has an almost doughnut-like, breadiness—like brioche. Its sweetness fades to a mild tartness—with a plum like quality as you hold it in your mouth. Black is more bitter than the lighter lager, as well. It's not a biting bitterness, but those dark, toasted malts have a tendency to accentuate a beer's bitterness, along with anything that would come from the hops. I've been seeing more and more American made dark lagers on the market—Saranac Black Forest and Magic Hat Howl, to name a few—and of course Guinness, has recently released it's Black Lager, internationally. Session Black holds it's own with these beer, it's dark and complex and just a fun beer to drink. So, there you go, the Session lagers are proof positive that the old adage of keep it simple, stupid—works. On the consumer end, why not, occasionally simplify things to a 50/50 decision—dark or light? Not all the time, mind you, lord knows we all love debating the merits of double chocolate-cherry-milk stout, but once in a while it's nice to throw our ale-ish caution to the wind and leave our lager-y decisions up to a coin toss. I'm pretty sure you'll be happy 100% of the time. Helles or Dunkel. Easy as it gets. I'm often dissapointed by American craft dark lagers. Chocolate and crystal malts just give me the same impression of an ale. I have no idea of how any of the beers I've tried where fermented with ale strains at cold temps or traditional lager fermentations. Maybe its some esters or american hops, but a lot of these beers taste like ales. That said. Sierra Nevada does a great job with the Summerfest. I had a Cigar City Ligero schwarzbier that was pretty darn good, but way too roasty. This must be one of the best beer reviews I've read in a long, long time. 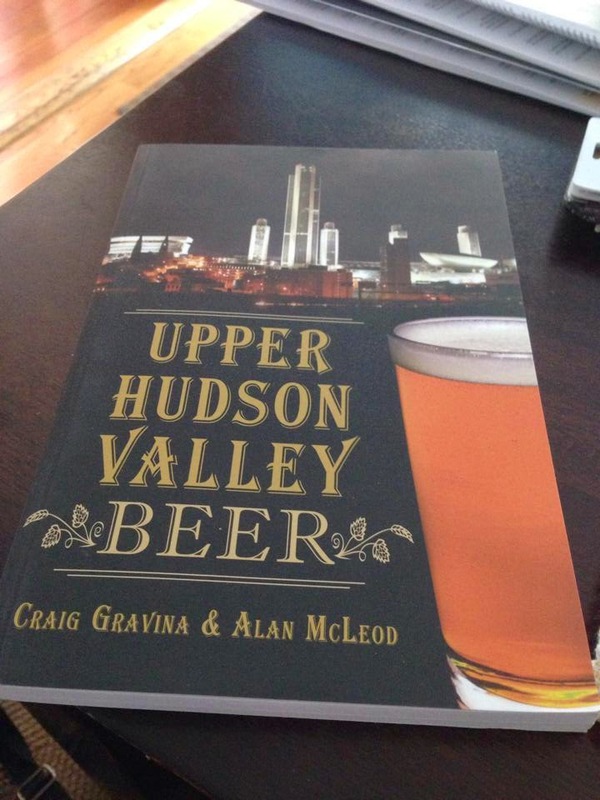 I haven't drunk those beers, of course, but after reading your post I couldn't help but getting the impression that you've understood those beer perhaps even better than the brewer. Brilliant writing. @Andrew - Yeah, I know what you mean about American Dark lagers. I mentioned Magic Hat Howl, but I'm not a big fan. I do, however, think Session Black is pretty successful. @Max - Wow–I don't know what to say, other than thank you! You are an American, aren't you? I'm from Central Europe and believe me, there is not just two kinds of lager. According to colour there are pale, amber, semi-dark, dark and black lagers. According to styles there are Munich Helles, Pils from Czech republic and Pils from Germany, sometimes you can find Dortmunder/Export lager. There are also Märzen and polotmavý ležák (semi-dark czech style lager) and maybe Vienna lager. And of course there are differences between Munich Dunkel (Dark lager) and Schwarzbier (Black beer). World of Ales, Weizens, Witbiers, Porters, Stouts and other top fermented beers is more wider than world of lagers, but it is not as simple as you declare in your article. You are absolutley right, Helles Lager and Pilsner are totally differnt beers, but I never said that there are only two kinds of lagers. What I said was there are two categories of lager—and I may even, acquiesce and let amber lager slip in there as a category. Although, my rule of thumb, for light versus dark, is that if I can easily see through the beer in its glass, then it's light, if not then it's dark. That sort of makes amber moot. You may, however, have missed my sarcasm about the simplicity of Brown Ales. I forgot to write that I know you wrote: "I'm not talking style here, I'm looking at the broader context", but if you classify Brown Ales to three categories, you have to realize that Helles lager taste differently than Pilsener. And there are also some local specialities like Rachbier, Zoigl, Ungespundet and others which I didn't mention before.